Last week, Jessica Labrencis reported on [% 2458806 | | airfare increases %], just in time for the busy holiday season. Would these increases be permanent, she asked, or get rolled back like so many often do? Yesterday, Joe Sharkey of The New York Times replied: They’re here to stay. Here’s why: Fuel prices are up. Airlines are struggling for long-term profitability. Flights have been trimmed, with a reduction in the number of routes flown per day and cutbacks on less-profitable destinations. As such, passenger demand for seats is at record levels, and airlines are flying near capacity. Because there’s been continuing demand despite raised prices, the airlines now hold the cards and can charge what they want. It’s never pleasant to get more sticker shock during the holidays. And unfortunately, this is one expense that may worsen as we head into 2008. The best strategies for now? Continue to monitor fares using a service such as Farecast or a flexible-date search on sites such as Hotwire or Travelocity. 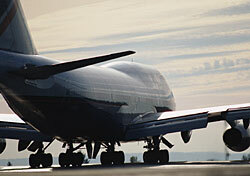 Check low-cost carriers such as AirTran or Southwest. Try to redeem your frequent flyer miles. Or, plan on taking a road trip.